No modern kitchen is complete without sleek and stylish counter stools. While their name may suggest that they are tailored to kitchens, our wide range of bar chairs can be used throughout the house. From counter height stools to maximise the utility of your kitchen island to adjustable height stools that can be used throughout the house, our extensive range of styles and colours are sure to please. Gas lift bar stools make it easier than ever to add a stylish and practical touch anywhere in your home, from the man cave to the outdoor dining area. We appreciate that the tastes of all of our customers differ, so we have made sure to stock something that is sure to suit any preference, from rustic and homely to minimalistic and clean. Those wanting a warm touch should consider our wooden bar stools, while more austere tastes may prefer our metal bar stools. Whatever material you prefer or colour scheme you are drawn to, you will be spoilt for choice while browsing our range. Stylish and sleek, there's no better way to add a cool touch to your home that guests will love than by investing in a set of bar stools. Style and Comfort: Who Says You Can’t Have Both? Luxuriously padded and oh-so-comfortable to sit on, kitchen stools make for the perfect versatile furniture item in your home. Lightweight yet sturdy, our swivel bar stools are highly functional as they can be moved around the home, creating a dynamic and entertaining experience. Because they are fully adjustable, they can also accommodate people of different heights, allowing for comfort for the whole family. Because our bar chairs are secure and stable, you can entertain carefree knowing that there is minimal risk of any stools toppling over. 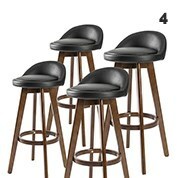 Many of the contemporary bar stools at MyDeal also feature a foot rest, ensuring maximum comfort. 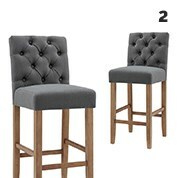 Whether you’re after breakfast bar stools that the whole family connect over or bar chairs that are so comfortable you can spend all evening sampling your liquor collection, MyDeal’s range will truly suit everyone. MyDeal has earned a reputation for being a one-stop shop that customers can rely on for products from almost any category imaginable. In addition to stunning bar stools, you can complete your home entertainment and dining area with our mini bar fridges, replica tolix bar stools, small wine fridges and replica Eames dining chairs. With many of these products having a complementary aesthetic, you’ll find that your home will begin to resemble something out of a designer furniture catalogue, without the whopping price tag! Looking to furnish your business instead of just your home? Bar stools are the perfect addition to cosy cafes, trendy restaurants, chic bars and any other leisure or entertainment venue. The range of styles available at MyDeal means you can be sure you’ll find counter stools that brings out your brand identity. Customers will be blown away by the cohesive and stylish aesthetic, as well as the comfort of your counter stools, being more inclined to linger and enjoy themselves at your venue for longer! .